Sydney cafe: Australians say to Muslims "I'll ride with you"
As a gunman holds people hostage in a cafe in Sydney, thousands of messages of support have been posted online for Muslims in Australia who are afraid of an Islamophobic backlash. The spark was this post on Facebook by Rachael Jacobs, who said she'd seen a woman she presumed was Muslim silently removing her hijab while sitting next to her on the train: "I ran after her at the train station. I said 'put it back on. I'll walk with u'. She started to cry and hugged me for about a minute - then walked off alone'. The story of Rachael's encounter with a woman in religious attire inspired this Twitter user, 'Sir Tessa', aka Tessa Kum: "If you reg take the #373 bus b/w Coogee/MartinPl, wear religious attire, & don't feel safe alone: I'll ride with you. @ me for schedule," user 'Sir Tessa' tweeted. Moments later she tweeted "Maybe start a hashtag? 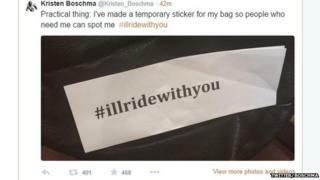 What's in #illridewithyou?" Thousands of people have now joined the spontaneous campaign, offering to meet Muslim people at their local stations and to ride with them on their journey. "I saw one tweet that was just a very small act of kindness to a frightened Muslim women on public transport and it pretty much broke my heart," Tessa Kum told the BBC. "And it just seemed like something that there should be more of in the world. I can't say that I planned this at all. It has been amazing to watch this take off. There were 40,000 tweets using the hashtag #Illridewithyou in just two hours, according to Twitter Australia; 150,000 in four hours. And it's been rapidly growing since. "Please, if you're going to use #illridewithyou, include journeys and times, make it genuinely useful not just a trendy thing to tweet," was the message from Sydney FC's official Twitter account.